Here is what Ambode told the new permanent secretaries he just swore in, as his tenure draws to a close. Mr. Akinwunmi Ambode swore in new Permanent Secretaries on Monday, October 29, 2018 and charged them to ensure effective service delivery to a city of over 22 million people, as his tenure as Lagos Governor draws to a close in a couple of months. The newly appointed permanent secretaries are Dr. Olabisi Taiwo (Ministry of Health), Mr. Olusegun Ajibade (Public Service Office), Mrs. Abiayo Akinsiku (Primary Healthcare Board), Dr. Yusuf Jimoh (Ministry of Special Duties and Intergovernmental Relations), and Mr. Ganiyu Rufai (Ministry of Commerce, Industry and Cooperatives). “With this appointment, you have all effectively become the Accounting Officers of your MDAs (Ministries, Departments and Agencies). 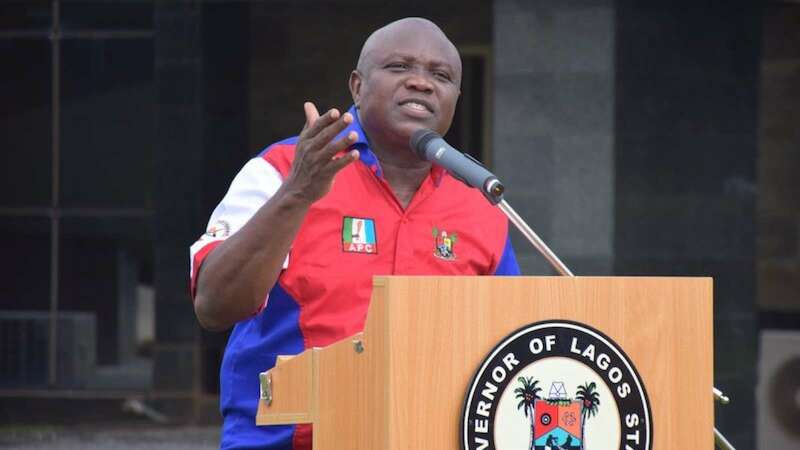 You have been entrusted with a bigger and more sensitive responsibility which will put to test your leadership and managerial skills”, Ambode said. Lagos is experiencing something of an infrastructure crisis at the moment. Roads are crumbling, memorizing where potholes have sprung up has become a daily routine for Lagosians, roads are flooded immediately after the slightest of rainfall, refuse heaps dot door steps and drainage channels and miscreants lurk in dark street corners to rob and scare. Ambode reminded his crop of new permanent secretaries that the next couple of months won’t be smooth sailing for them all because of the enormous work awaiting them in their offices. “Nobody expects you to reinvent the wheel. What is expected of you is to bring to bear your knowledge and experience so that the machinery of governance can roll faster and deliver more quality results to the teeming population of our state,” the governor told his new hires. Ambode’s second term bid crumbled like a pack of cards after godfather Bola Tinubu and the APC grassroots political structure in Lagos, deserted him for allegedly not carrying party loyalists along. On October 2, 2018, anointed APC governorship aspirant, Babajide Olusola Sanwo-olu, polled over 800,000 votes during the governorship primary to defeat Ambode and secure the party’s flagbearer ticket. Ambode has been accused of going to sleep and ditching governance altogether since he lost the primary election. Lagos votes for a new governor on March 2, 2019.